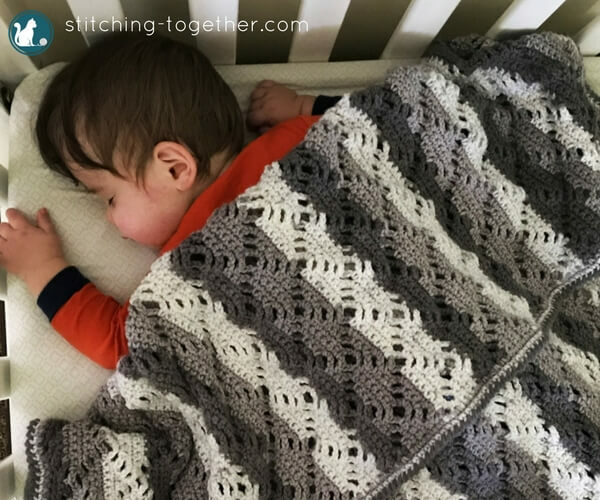 You can make this gender neutral, modern crochet Diamond Lace Baby Blanket. 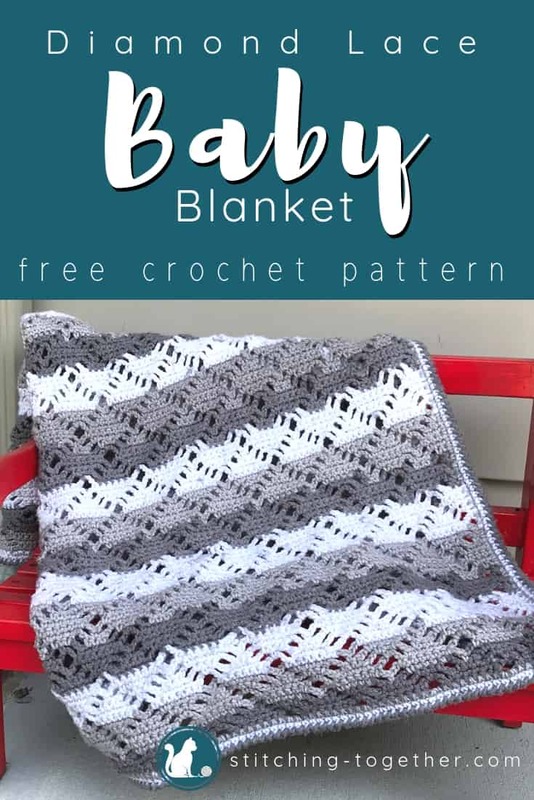 Easy to make and cherish forever plus it is a free crochet pattern. Keep scrolling to get started! 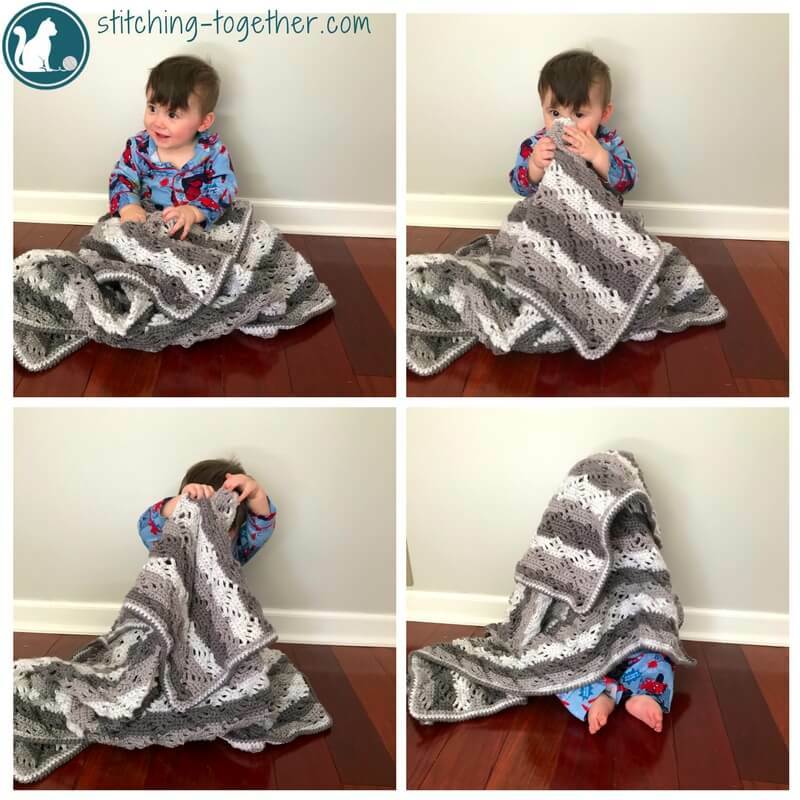 When I had my first baby, I was shocked at how many baby blankets we received: store-bought ones, handmade ones, thick ones, thin ones, soft ones, airy ones, big ones, small ones…. 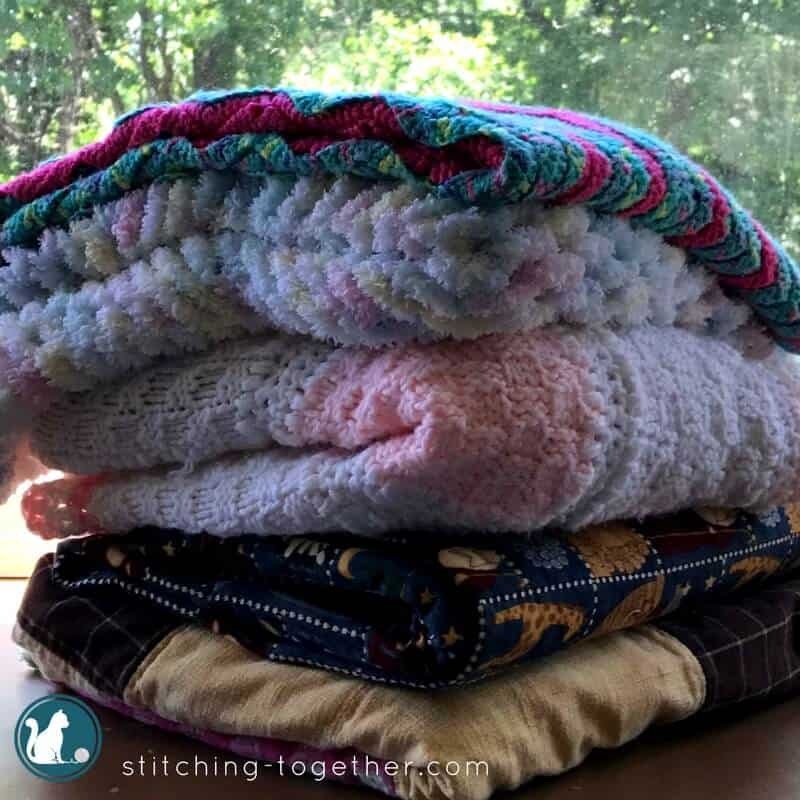 I had no idea what I was going to need all those blankets for, and I honestly remember saying that I was never going to make a baby blanket again. Now that my oldest is four, I have a little perspective and can look back and realize that we ended up using almost every single blanket. This blanket is so fun to make. The pattern takes a couple of repeats to get used to, but once you do, it is a breeze! You can block it to accent the diamond lace pattern but I couldn’t bring myself to since much of the texture would be lost. I did block the Wrap Me in Diamonds Crochet Scarf if you want to see what the pattern looks like blocked. Tejiendo Peru has a great graph of the diamond lace stitch. If you speak Spanish, their site it great. If you don’t speak Spanish, you should check it out any way as it is filled with beautiful graphs and pictures. Visiting Pinterest and then searching for the Diamond Lace Stitch is the easiest way to find the graph. I love how the pattern and texture run diagonally and the stripes horizontally. Using Sweet Rolls (amazon) makes the striping effortless and the ends minimal. I allowed the colors to change wherever they did naturally and didn’t splice and dice to get them to be perfect. 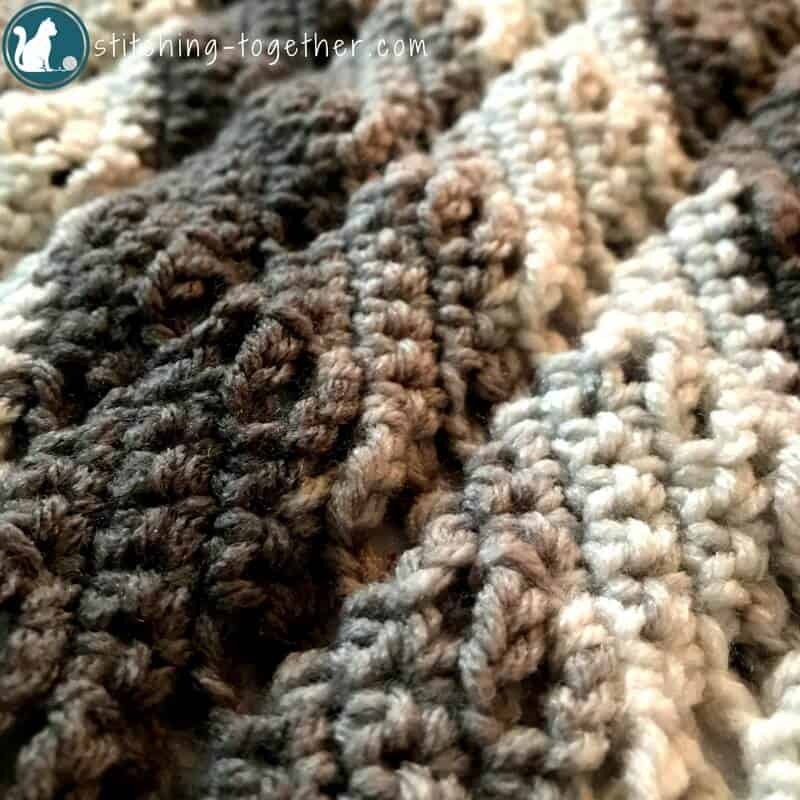 The border is a simple crab stitch which if you haven’t learned how to do, check out how to crochet the crab stitch. This was my first crab stitch border and I love the beauty and simplicity! Before we get to the pattern, don’t forget to pin it for later! Do you like printable PDFs of your patterns? You can purchase the ad- free PDF! When working in the chain spaces, you can work around the chain instead of into it. Repeat Rows 2-9 to continue to continue the pattern. Round 1: ch 1, sc in each st and sp around the entire outside of the blanket putting a sc, ch-1, sc in each corner, join with a sl st to the first sc of the round, turn. Round 2: ch 1, sc in each st around putting 3 sc in each ch-1 sp at the corners, join with a sl st to the first sc of the round. Round 3: ch 1, crab stitch (crab stitch tutorial) in each st, join with a sl st to the first sc of the round. 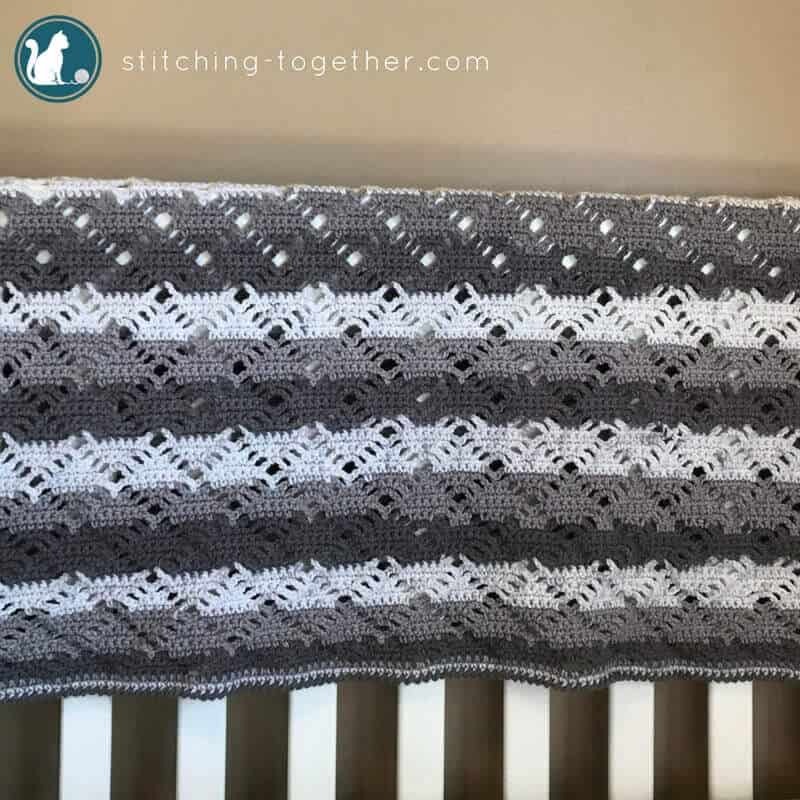 Once you finish your Diamond Lace Baby Blanket, I would love to see a picture! Use #stitchingtog on social so I can see your pictures. Love the pattern!! Anxious to try it!! The baby seems to like it…lol…like a peek-a-boo blanket!! Oh my goodness! I got rows 1 and 2 done. I thought, “hey, I can do this!” I cannot make heada or tails of it. Is there a tutorial video for this pattern? I really want to make this. Hi Charlotte, I am sorry you are struggling with the pattern! Give this video a try: https://www.youtube.com/watch?v=tnSu0sxN8c4 I haven’t watched all of it, but it should help with the basic concept of the stitch. I just had a great grandbaby two days ago and this is perfect for him. Ty . Your a loving person. What does one use the large-eye tapestry needle for? I use it to weave in my ends, but you could use your hook to do that too! Me too! Just finished the baby blanket for my great-nephew and love it so much I decided to make one for myself! Searched a long time for the perfect pattern for a baby blanket for my soon to be born niece/nephew, and so glad I found this! I just finished making it with Caron Baby Cakes yarn. Works up quickly and the pattern is easy to remember after a couple rows. It’s a nice delicate stitch which leads to an airy lightweight blanket! 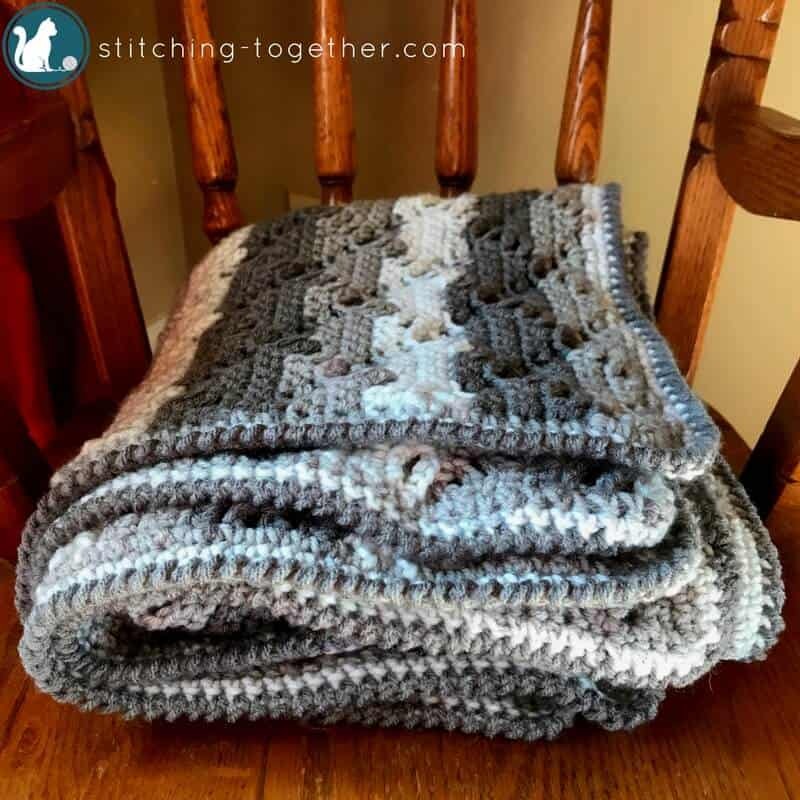 Thanks so much for sharing this pattern for free! So glad you like it Amanda! Thank You for this lovely pattern. It made me realize that the project I had planned to make will work! I had wanted to make a throw for my bed in a coordinating color but also the diamond shape. I have a pieced quilted bedspread and the way it is put together the squares look like diamonds. I had narrowed it down to a couple of choices and asked my Fiancé for input. While it wasn’t your page the pattern was on, this is what he picked! Why tell you all of this? The reason is that the yarn I found that was a great match in color was actually Lion Brand “Scarfie”. I was very unsure how that would look in this pattern. Your Beautiful baby blanket made me realize that I could (and will) use that yarn and have a nice looking throw! I can’t tell you what a huge, huge help that is to me!! I’ve been mulling it over for a year! teeehee! I’m not extremely experience in crochet, so this will be my first big project. I’m just curious on when you switch colors? After how many rows? Can’t wait to start this! Love this pattern…. getting ready to start it.. making two.. one of my best friends is about to become a grandmother for the first time.. and it’s twins, a boy and a girl!! This will be a fun project!! That is so sweet of you Dana! I hope you have fun!